You’ll find a curious thing at the end of a little path beside the school in the Kent village of Chiddingstone. It’s a great lump of sandstone, formed about 135 million years ago when this part of the world was a swampy mess. 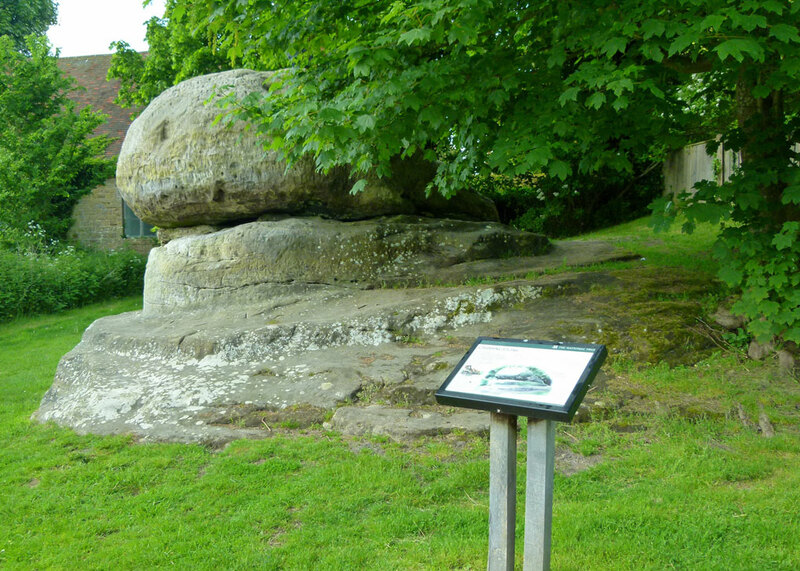 And this large rock is called the Chiding Stone, because (so they say) nagging wives and other wrong-doers were brought here and rebuked – or chided – by the massed villagers. Nice idea, eh? An early form of trial by social media. Regrettably – no one knows whether it is true, or not. Other suggestions are that the stone was a Saxon boundary marker, a place where the ancient Britons conducted their judicial affairs, or that it had an interesting part in a Druid ritual. Remarkably, I didn’t know anything about the Chiding Stone until Son of Britain, a mere strap of a lad, escorted me there on one of my days out. It’s encouraging to think he may have a taste for the bizarre, just like his old man. But I was disappointed not to see a queue of sheepish-looking wives and ne’er-do-wells waiting to be rebuked. Some maintain that the village name means ‘stone of Chidda’s tribe’. My trusty Oxford Dictionary of English Place Names tells me that that Cidingstaene means a stone associated with someone called Cidd or Cidda. So there you go – though that only takes you back to Saxon times; it must have been called something else before that. It is said the area prospered on pig farming, because the large number of oak trees in the forest gave the pigs lots of scrumptious acorns. Later, a primitive iron industry flourished. Chiddingstone now is tiny, and quite lovely. The village is almost entirely owned by the National Trust, who purchased it in 1939 “to ensure its preservation”. There must be a story behind that, surely? In any event, it is apparently a wonderful example of a Tudor one-street village in typical Kent style. At one time, Sir Thomas Bullen (or Boleyn) owned property there. 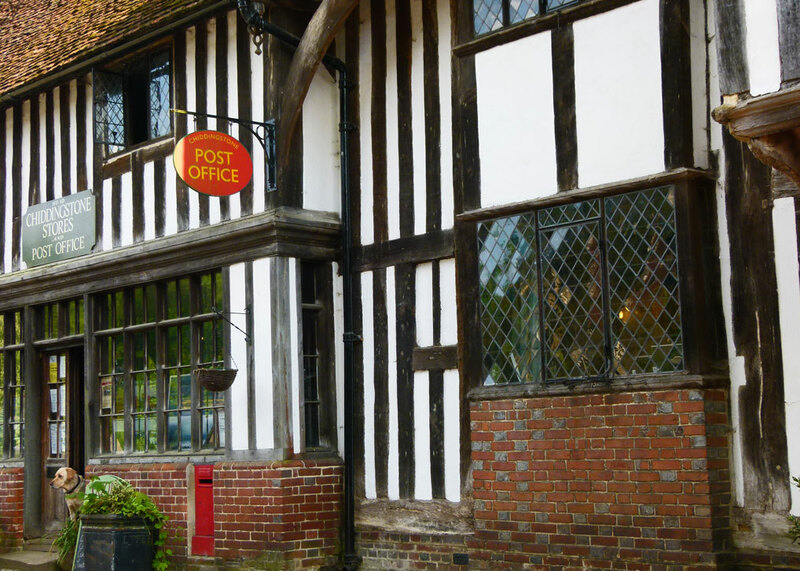 Almost three-quarters of the buildings are more than 200 years old and the village shop and post office dates back to 1453 – just before the Wars of the Roses and already old when Anne B was sent by her dad to buy stamps. The High Street takes a sharp bend to the north that it would not have done in Tudor times; sometime in the 19th century, the owner of Chiddingtone Castle, Henry Streatfield, diverted the road away from his land so that people wouldn’t walk over it. It’s a popular film and TV location. 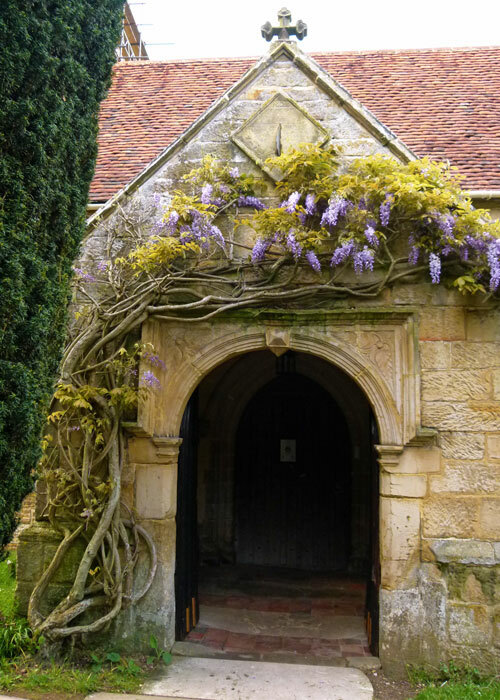 Among other productions, Chiddingstone has featured in Elizabeth R (1971) starring Glenda Jackson, A Room with a View (1985) and Terry Jones’ version of Wind in the Willows (1996). I could have lingered; the Castle Inn looked tempting, all tile-hung and leaded lights, and St Mary’s appeared to be a gem. Alas, there was scaffolding over the church and matron was expecting me back…next time, maybe I could risk a little chide. Or perhaps a modest rebuke. Just the one. Such a pretty place! I didn’t know the National Trust bought entire villages…is that unusual? I know they’ve done it with Lacock – http://bitaboutbritain.com/lacock/ – probably other places too! I just love seeing your countryside and reading the stories which follow them, it’s always a delightful adventure and hunt! Beautiful captures, cute pup too! There are several rock climbing opportunities near Tunbridge Wells, including High Rocks. Harrisons Rocks near Groombridge is also quite well known. I think I’ve just put Chiddingstone on my ‘must visit’ list, it looks so lovely. I think I need to watch this 1996 version of the Wind in the willows that I’ve never seen! Another fascinating read. Thank you. I have just read a post about Knole and now here I am just up the road in Chiddingstone! 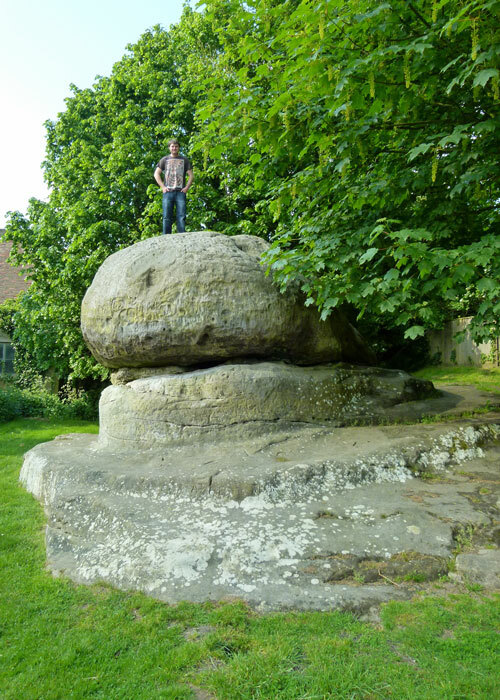 I have relatives in Edenbridge so you would have thought that I had seen the Chiding Stone – but no. I have driven through the village but never stopped. Thank-you for showing me what I have missed, Mike! Well, I used to live just down the road and didn’t know about it until relatively recently – after I’d moved away! Interesting post – what a beautiful village. It does look like an appealing place to visit. Quite a stone to climb up on! We also have very large boulders that look very much like the “mountains” and your stone is a dead ringer for many of our massive boulders. Another fun post. And great photography. It is a very unusual stone. I wonder how it was formed, geologically. I’ll have to ask a relative of mine who is very much into great big lumps of stone and reads up extensively about them, although I must admit he’s never mentioned this.